The Manfrotto Maxima-84 Hybrid On-Camera LED Light is a constant video light that transforms into a flash unit for still photography. A push button on the back activates flash mode; an included sync cable connects and syncs the light to your camera; and upon your snapping a photo, a flash goes off at 4 times the brightness of the max output in video mode, which is 670 lux at 3 ft. when the light's 0-100% dimmer is set to 100%. The native color temperature in video mode is 5600K daylight color. The light powers by a built-in rechargeable battery and comes with a charger. The charger has U.S. voltage of 110 and requires an adapter for international use. The adapter is sold separately. The battery lasts about an hour-and-a-half. 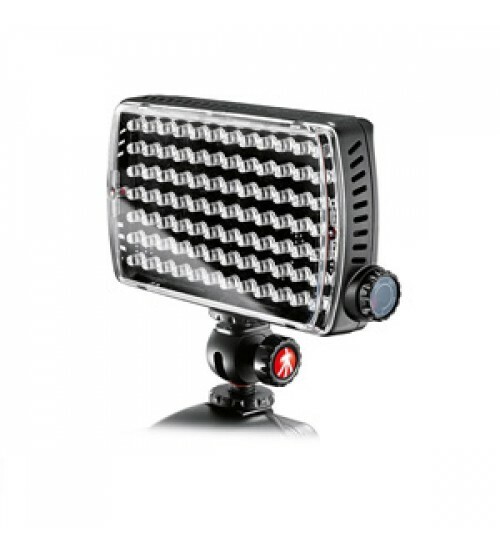 Also included are a gel and diffuser set for warming and softening the 5600K color, and a multi-functional Manfrotto ball head for attaching the light to your camera. The ball head can hold the light in portrait or landscape mode -- it connects to the light by shoe mount, and the light has a shoe on both its long side and short side. Either way you connect, you can pivot the light, angle it, and rotate it on the ball head. You can also unscrew a section of the ball head to reveal a 1/4" thread by which you can mount the light onto various stands that support 1/4"-20 mounting. The light having two shoes lets you attach it to other Maxima-84s. You can stack as many of them together as you want.